The outward aspect of the premises is strikingly in accord with the firm's fame. The frontage in Thomas Street is built of white Glencullen granite, and the clear style of its architecture lends an impressive air of superiority to the vicinity. 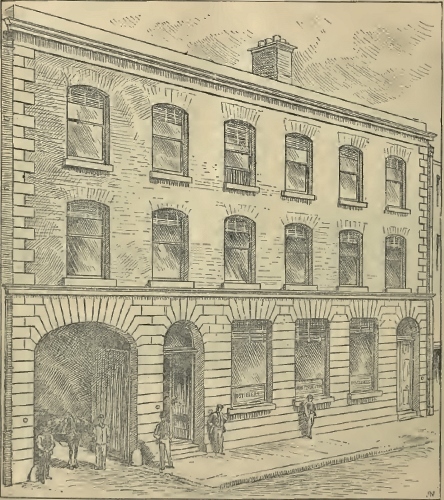 Crossing the asphalted yard, the first building, or rather the first division of a long row of buildings, reached is the mechanical shop, the roof and upper floor of which are carried on metal columns, thirty feet in height, cast by Messrs. Koss & Walpole, of Dublin. Entering this department,we find it beautifully built with while enamelled bricks, and replete with every necessary for the purposes for which it is used, viz., a smithy, fitting and turning shop, etc. It contains, amongst other machinery, a fine lathe, by Messrs. G.Booth & Co., of Halifax, 21 ft. Long, 10 1/2 in. centre; a large drilling machine, by Messrs. Craven, of Manchester; and several other valuable machines too numerous to mention. 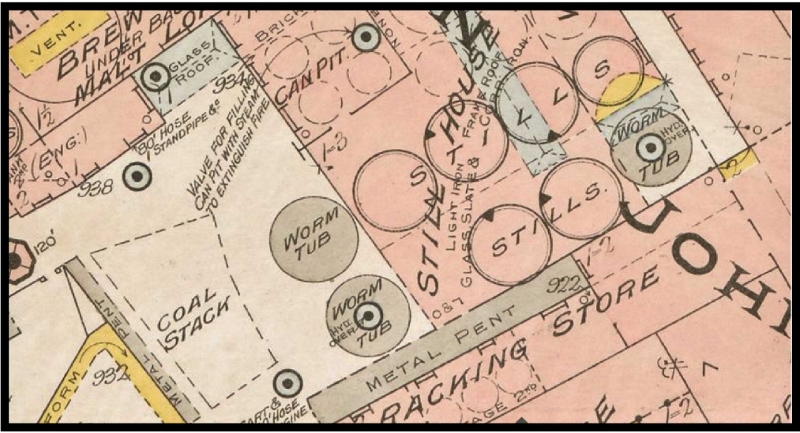 The position of the stills from an 19th century insurance map. The invitation to visit Messrs. Power & Son’s John’s Lane Distillery was that which was accepted by the greatest number of members, and there the Society had an opportunity of viewing a modernised old distillery. 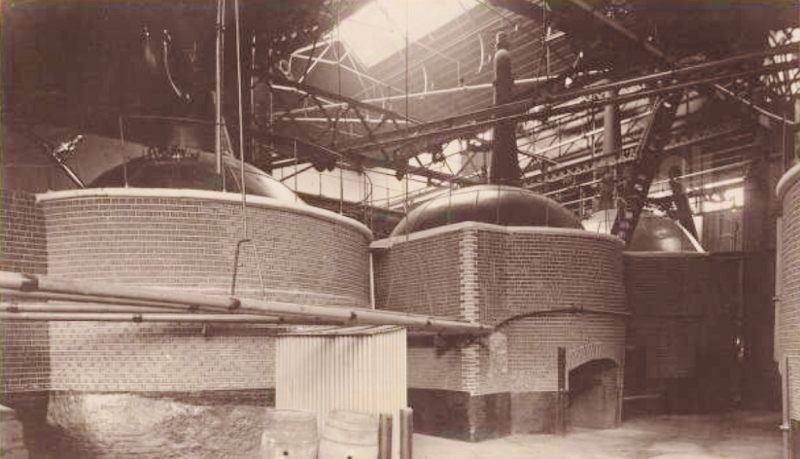 The establishment is this year celebrating its centenary, but almost the whole of the plant and premises have been rebuilt within the last twenty years, and the opportunity taken advantage of to get the most modern and approved distilling apparatus at the time of the alterations. The visitors were first shown the ground floor of the new mechanic’s shops which are being fitted up, and which contain a smithy and coppersmiths’ and brass finishing shop, while above, carried on metal columns, is a carpenter’s shop. The corn receiving store was next visited, where the barley is received, sampled, and conveyed to the receiving rooms, and thence passed through the cleaning machines and exhaust fan (Vangelder’s system), by which all foreign matter is eliminated from the grain. After cleaning the corn is stored and seasoned, and is converted into malt in the usual way, then dried in kilns which are heated by a smokeless steam coal. The next process consists in grinding the corn and crushing the malt, and finally mixing these materials in the most suitable proportions. The mills contain one of Turnbull’s machines, and seven sets of stones, 4ft. 10in. in diameter, and rollers 3ft. by 18in. 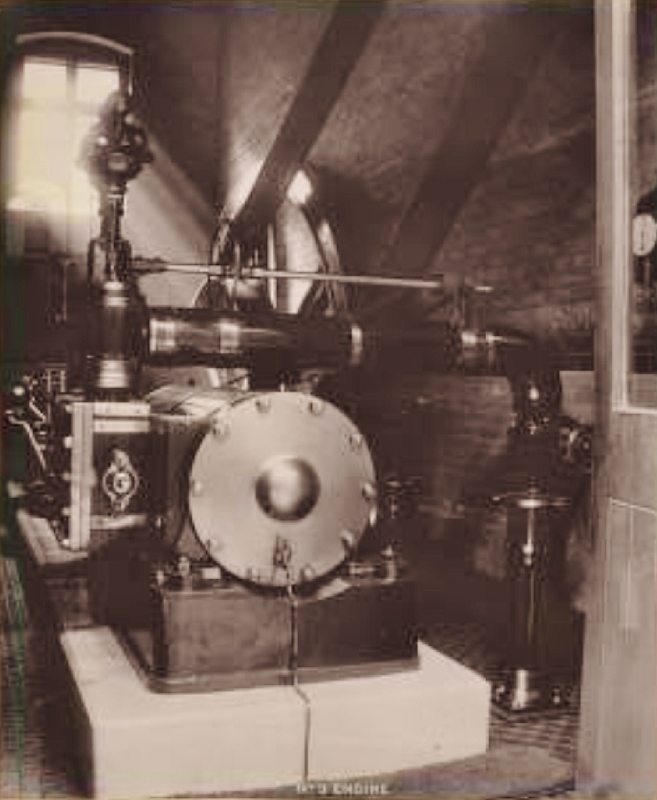 A compound condensing beam engine of 460 h.p. is specially erected for supplying the power for driving the mills, which are capable of grinding 1,500 barrels of grain in twenty-four hours. After crushing the corn passes through a second cleaning machine, and is then carried by elevators to the brew-house, where the mashing takes place. The brew-house is almost entirely constructed of iron, and is connected by a gangway with the mills, so that the visitors could pass direct from the mill-house to the floor on the top of the brewing coppers. There are two mash tuns, 33ft. in diameter and 7½ft. deep; they are capable of mashing 500 barrels each, or 35 tons daily. During the distilling season the mashing is regular at 7 a.m. and 7 p.m., and lasts for four hours. Two metal underbacks receive the wort from the mash tuns before it passes into the back house, where the fermenting process is carried out in nine large wash-backs capable of holding 36,000 gallons each. For working the agitators which keep the malt in motion during the mashing a large compound condensing beam engine is employed. A centrifugal pump is also worked by this engine, which is fed by two Lancashire boilers of steel 37ft. long. 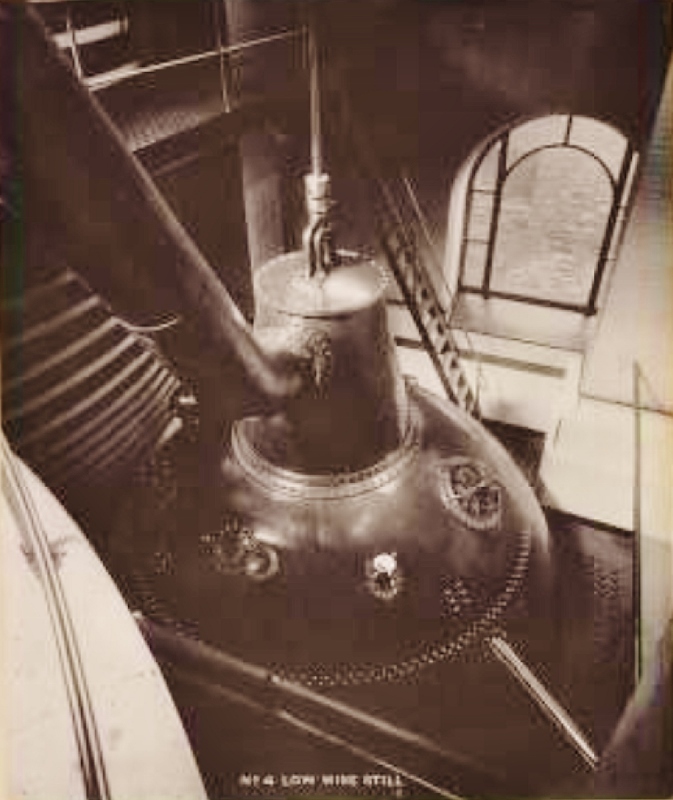 The Vartry water is used for brewing purposes, and is boiled in four large coppers in the “copper head.” The wort from the mash tuns is cooled in horizontal coolers to 70° Fahr. from 150° Fahr., the hotter water being used for the second extraction. The cooled wort is fermented with fresh yeast, obtained from Guinness’, in the back loft containing the wash- backs already referred to. We were informed that all the distilleries in Dublin were dependent on Guinness’ brewery for their yeast supply, and that none of the distilleries had as yet cultivated yeast for their own work. After the yeast has done its work in the back loft, the fermented wort or wash is ready for distillation. The still house at Messrs. Powers is a fine building, 68ft. long by 66ft. wide and 57ft. in height. It contains six pot stills, the two wash stills each holding 25,000 gallons and believed to be the largest pot stills in the world. The wash stills contain a stirrer, which keeps the liquors in agitation during the distillation and prevents charring of any solid particles at the bottom of the still. During distillation the wash froths to a considerable extent and necessitates a large still. The distillate of weak alcohol after condensation is run into the low wines stills, and is there subjected to a second distillation, whilst the residue in the wash still is pumped into a store tank which is kept stirred ,and sold to the farmers or run into the Liffey. This residue, or pot ales, contains a large percentage of nitrogenous compounds, which renders it a valuable food stuff for cattle, its dilution and bulk being, however, an important drawback to its extended use. Lactic and other organic acids are present in the pot ales. Neither Messrs. Power’s nor the other Dublin distilleries have at present started any experimental works for the recovery and utilisation of this waste product. In Boston Mr. Waite has already demonstrated that lactic acid can be cheaply manufactured from glucose, and Mr. Cross has suggested that this pot ale is a suitable medium for the growth of the lactic acid ferment. 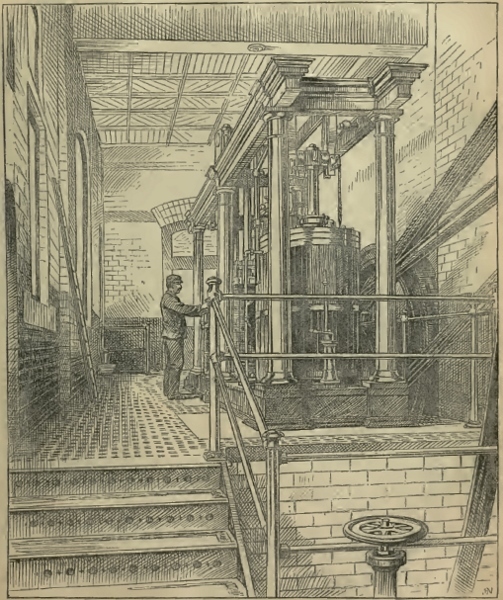 We cannot doubt that the Dublin distillers will, before long, adopt the new process, and possibly thereby create a new Dublin industry—viz., the manufacture of glucose, to be subsequently converted into lactic acid by their wash-still residues. The low wines distillate is subjected to a second distillation in the low wines or feints still, and the distillate thus obtained consists of three parts—(1) foreshots, (2) whisky, (3) feints—whilst the residue from the still, containing little else than water, is run away. 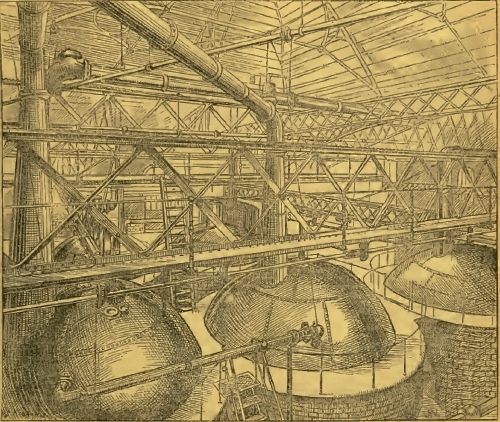 The three portions of the distillate are collected separately, the first and last portions being returned to the wash still and redistilled with fresh wash, whilst the whisky, or middle portion, is redistilled in the steam or spirit stills, and a product of varying alcoholic strength is obtained in the can pit or sampling room, where they are diluted down to a uniform strength of 25° over proof. The visitors were then taken to the spirit store, where the whisky is filled into casks, and which is now the oldest portion of the distillery. Here there is a hydraulic hoist for lowering and raising the casks to the bonded store, erected by Messrs. Ross & Walpole, of Dublin, and worked by waste hot water from the worm tubs. The ram is 22in. in diameter. The warehouses are eighteen in number, whilst the firm have additional bonded stores at the City Market and Westland Row, making a total capacity of 1,113,000 cubic feet of private distillery warehouses. 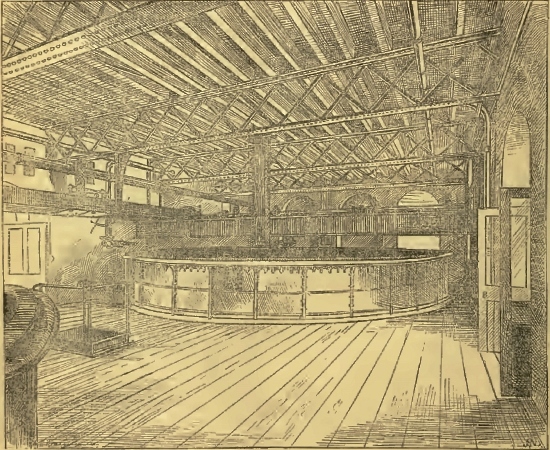 The cooperage, stables, and fire brigade sheds were subsequently visited, and the party assembled in the offices to sample the firm’s spécialité. The President, before leaving, thanked Messrs. Power for their kindness in throwing open their establishment. 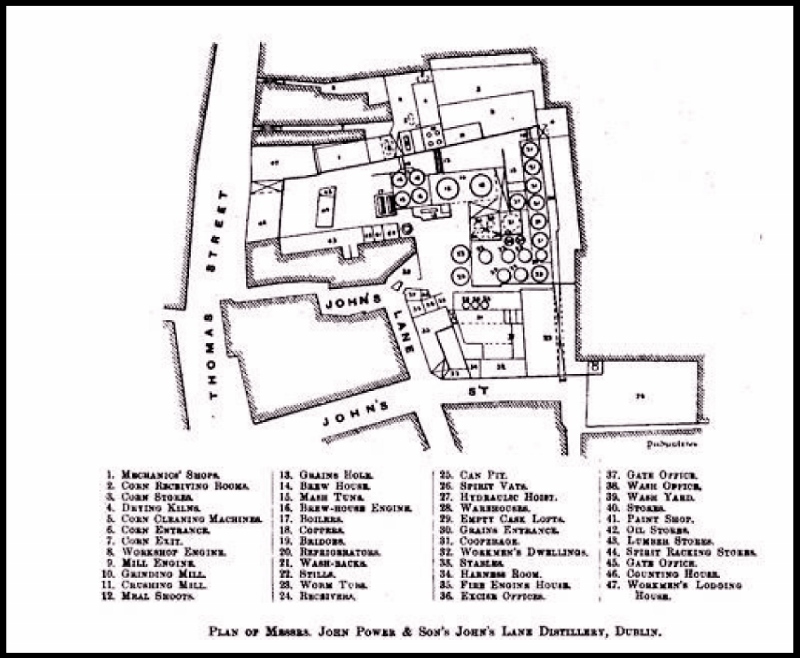 We give a plan of the John’s Lane Distillery. Whitaker's Red Book of Commerce or Who's Who in Business. 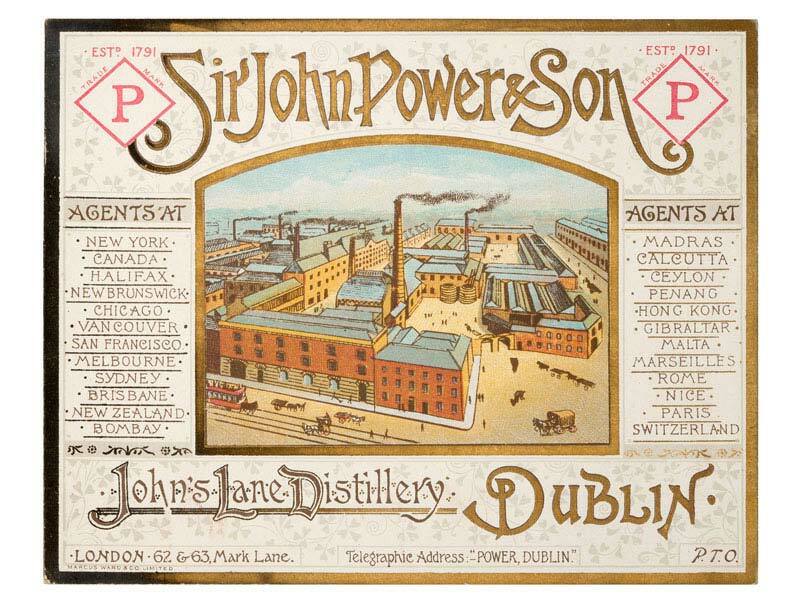 POWER (JOHN) & SON, Ltd., Pot Still Whiskey Distillers, John's Lane Distillery, Dublin. Hours of Business: 9.30 a.m. to 5 p.m. Established in 1791 by James Power (d. 1817). Incor porated as a Limited Company in 1899. Directors: James Talbot Power, D.L. (Chairman), Thomas Talbot Power, Joseph R. O'Reilly, D.L., Thaddeus F. Ryan, Louis Farrell, J. E. Fottrell. The John's Lane Distillery is one of the oldest of the Dublin Distilleries. The premises cover about eight acres of ground. Bottling Stores, South City Markets. Speciality: Pure Pot Still Irish Whiskey. Connection: United King dom, Foreign, Colonial. Agents in all principal Home and Colonial centres. Royal Warrant: By Special Appointment to His Majesty King George V. Tele phones: No. 5760 Avenue (London); Nos. 100 and 800 Dublin. Telegraphic Address: " Power, Dublin." Code: A B C (5th Edition). Bankers: Bank of Ireland. 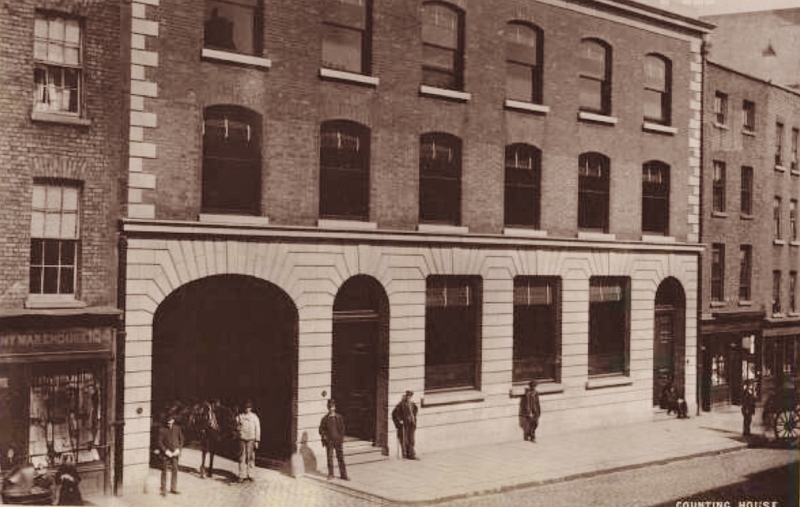 The distillery, belonging to Messrs. John Power and Son, is one of the old Dublin distilleries celebrated for the manufacture of “Dublin pot stillwhiskey,” and was established in 1791. The entire works have practically been rebuilt and refitted during the past ten years. They cover about eight acres, and reach from Thomas-street to the quays. The annual output is about 900,000 gallons; there are from 250 to 300 hands employed, and the daily consumption of coal is from 50 to 60 tons. There are five engines, two of which are McNaught compound condensing beam engines, one of 400, the other of 250 indicated horse-power. Both of these are by Messrs. Turnbull, Grant, and Jack, of Glasgow. The larger one is in the mill engine room, the smaller one in the mash house engine-room. The beam of the latter is of steel, and the engine is provided with a grooved pulley, from which power is taken by means of ropes. These ropes have been working night and day for three years without renewal, and are still in good order. The base of the larger McNaught engine is a single casting of seven or eight tons weight. A horizontal engine by Stephen and Bailey has been put down for the new workshops. It is a single cylinder engine, of good workmanship, and will give about 75 indicated horse-power, the steam pressure being 80 lb.Some new mechanical workshops are in course of construction. The roof and upper shop are carried on metal columns, 30ft. long, cast by Messrs. Ross and Walpole, Dublin. The lower shop will be used as a smithy, copper hearth, a fitting and turning shop. The upper storey will be appropriated for wood-working machinery and general joinery. The corn stores consist of five extensive floors, and contain usually 30,000 to 40,000 barrels of grain in the working season, which is from September to June. All the elevators are constructed of cast iron plates, as not to carry or spread fire, and they can be easily opened at any place. In the upper rooms the grain is laid out for seasoning and drying. It is subsequently fire dried by kilns, which are provided with perforated metal floors upon which the grain is spread out. The grain used for the manufacture of whiskey is a mixture of wheat, barley, oats, and malt. The barley and oats appear to be of sue in making the mass more open or porous. After drying, the grain is passed through the cleaning machines. A magnetic separator is used for particles of iron. The screening machines themselves are by Vangelder and Apsimon. The larger materials separated from the grain form a curious collection of boot-tips, nails, screws, pieces of brick, stone, &c., all of which ingredients are superfluous as far as the production of Irish whiskey is concerned. Leaving the screening machines, the visitor admires the huge exhaust fans by Schiele, and passes on into the mill, where the grain is reduced to powder. Here there are seven pairs of millstones 4ft. 10in. in diameter. They consist of granite bosses, with outside segments of French burr, all set in and backed with plaster of Paris. There are in addition rollers 3ft. by 18in. 150 to 200 bushels of malt are crushed per hour by the milling machinery. The crushed grain is lifted to the hopper loft, whence it is allowed to descend into one or other of the great mash-tuns in the brew- house. These are 7½ ft. deep; one is 32ft. in diameter, the other 35ft. They hold about 500 barrels each. The grain is stirred up during the mashing operation by rotating rakes, and is saturated with hot water. 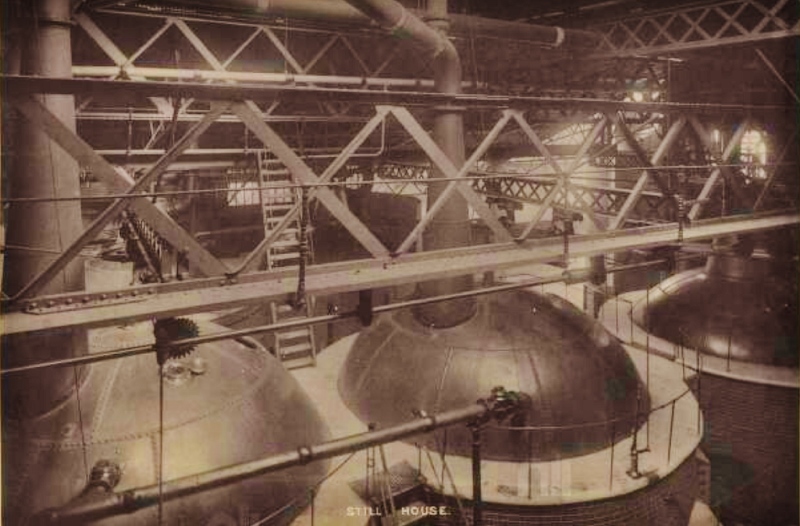 The “wort” here produced passes down through the perforated cast iron base to the metal “under-backs.” The weaker liquor is returned next day to the mash-tun. 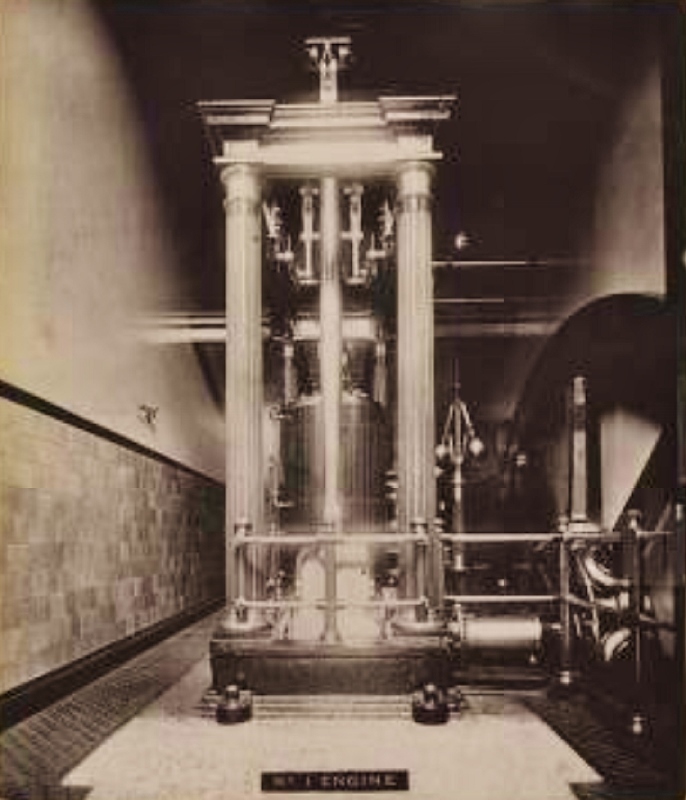 The wort passes to the coppers, which consist of four large oval copper vessels, wherein the wort is heated with water and mixed up by a mechanical stirrer. Large copper pipes run round the coppers, containing cold water to regulate the temperature. The capacity of each vessel is 15,000 gallons. The worts next pass over the refrigerators, which are copper pipes through which cold water circulates, on their way to the fermenting vats. There are nine fermenting wash-backs, each capable of holding one brewing, or 36,000 gallons. The liquor spends some three or four days in the fermenting tuns, where the mystic transmutation takes place, and whence it staggers on in an alcoholic condition to the still-house. Here there are six pot-stills, capable of holding from 15,000 to 25,000 gallons each. In these the potent vapours are distilled off by heat from the watery mixture, to be condensed in the worms close by. The worm-tubs are huge cylinders of wrought iron, 40ft. or so in height, containing within a copper coil or worm. A constant stream of water rises through the worm-tub, and is led off at the top for the purpose or working the hydraulic hoist. The ram for the latter, which is 22in. in diameter and 29ft. long, is situated more than 100ft. Below the surface of the worm-tub. 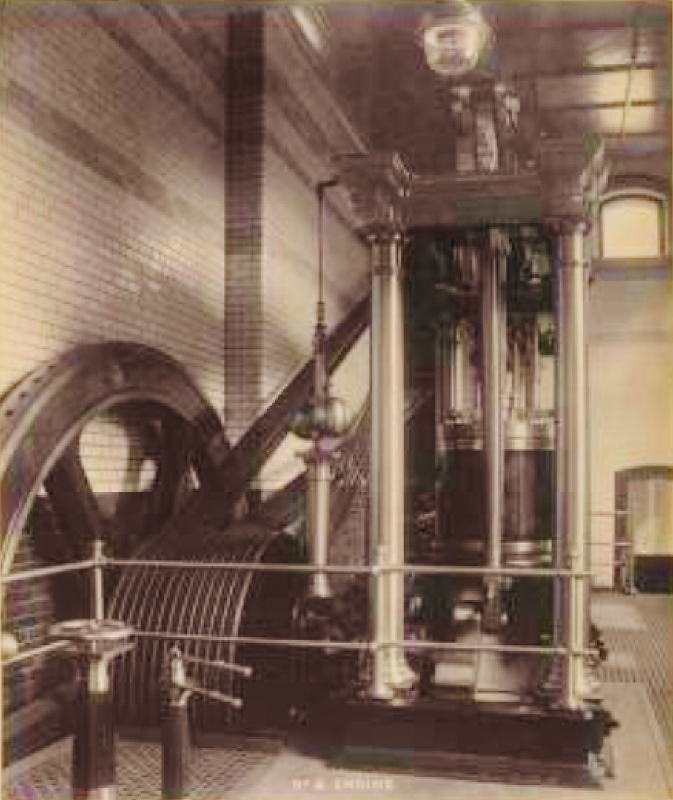 The hydraulic apparatus is by Ross and Walpole, of Dublin. The products of distillation are run down to the can pit or sampling-room, where they are tested. The first product, or “low wines,” has to be treated over again to form “feints,” and a third time to produce “spirits,” about which there is no guide. An automatic register in the can-room enables the Excise officers to ascertain the quantity of liquid temptation which has passed through. There are seventeen distillery bonded warehouses, and two outlying warehouses, one under the market building in George-street, and the other under Westland-row railway station; they are capable of holding in all up to 40,000 casks, having a total capacity of 1,113,000 cubic feet. No reflective person could contemplate these vast stores of power without moralising on the hogsheads of eloquence, of valour, and of resignation that are potentially pent up within their walls. The distillery, being built on the side of a hill, has the advantage of natural gravitation for the movement of the material in process of manufacture. The stables are built of enameled brick, and furnished with Musgrave’s fittings. arrangements, and the final product. Kennedy, Messrs. Procter, Whitley, and other members of the staff. Guinness’s black beer is, on account of financial considerations, the general, if not the exclusive, beverage of the poorer classes. Photographs of Powers by Thomas F. Geoghegan, photographer. They may have served as the source of some engravings in previous post..
More photographs of Powers by Thomas F. Geoghegan, photographer. Another photograph of Powers by Thomas F. Geoghegan, photographer.